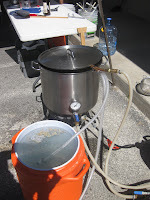 The previous post in our series on building a wort pump discussed creating the connections used by the pump on brew day. 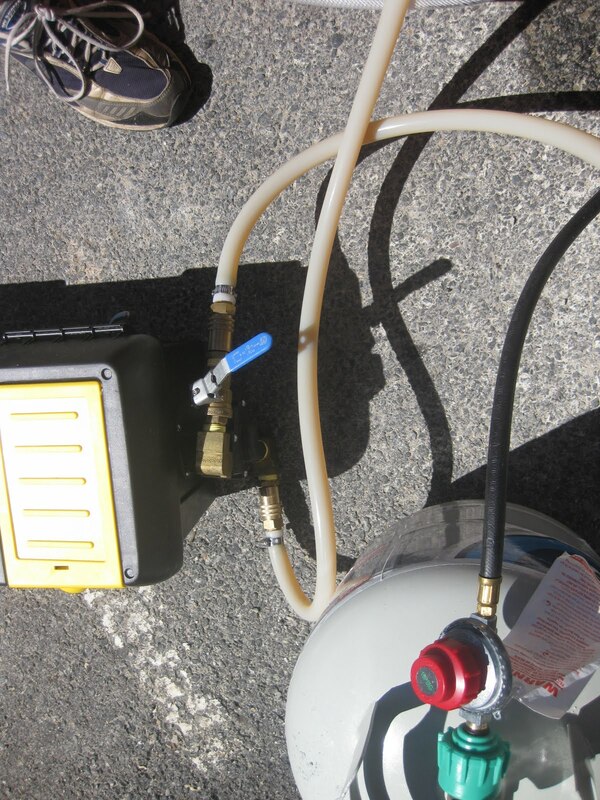 This last post focuses on using the pump during an actual brew day. The brew day in question was brewing a 10-gallon batch of American India Pale Ale (IPA) as part of a brewing demonstration at my local homebrew shop, The Fermentation Trap. The wort pump tool box is not used until the end of the brewing process (typically for the transfer of hot wort). 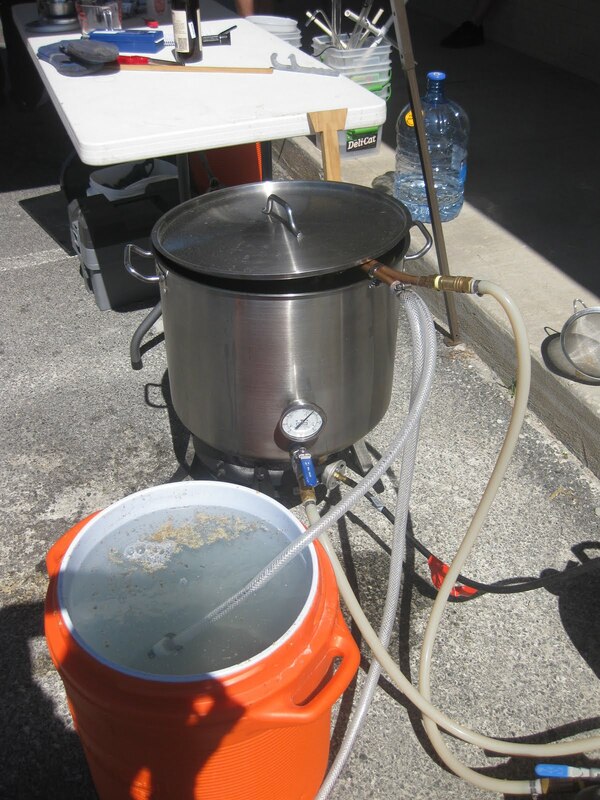 However, when getting out all of the equipment for a brewing session, it is important to make sure your pump and hoses are clean, available, and in working order. 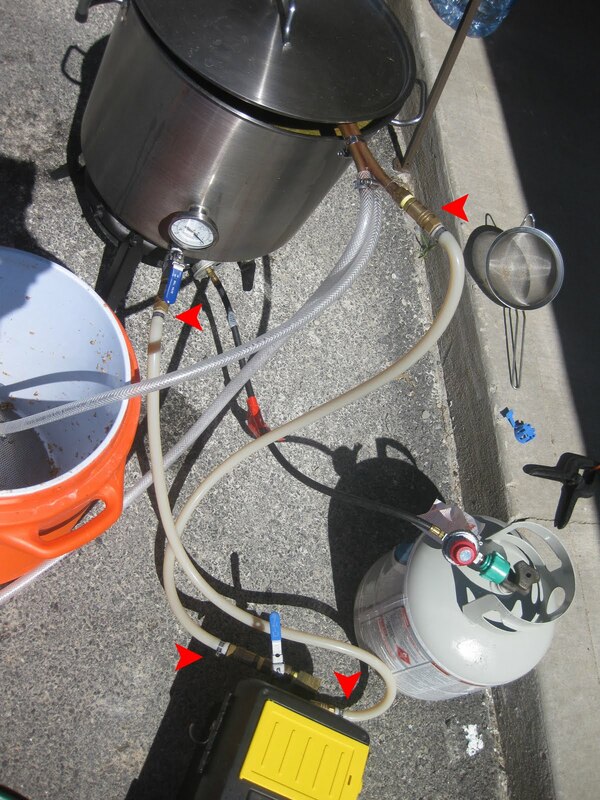 Fifteen minutes before the end of the boil, I hook my pump up to the kettle (connections noted in the image with red arrows). The purpose of running the wort through the pump before the end of the boil is to sanitize the entire pump pathway before cooling begins. Note how the pump is located below the kettle, which is important to prime the pump. I first connect the ball-valve that exits the kettle to the pump's intake. I connect the pump's exit port to another high pressure tube, but do not yet connect it to the quick disconnect on the "J" connection on my immersion chiller. Holding the exit tube that will connect to the immersion chiller high in the air, I open both the kettle's ball valve and the pump's ball valve. The wort will flow up through the pump and part way up the exit tube (this is important to prime the pump and get all the air out). I then connect the tube to the immersion chiller and turn the pump on. It should be fully primed and push wort through correctly. If not, play with the throttle ball valve until it pushes properly. At the end of the boil, add any flame-out hops and put a lid on the kettle. Then, connect the cooling coils to your garden hose and slowly push cold water through them. The "J" return on the immersion chiller will spin the wort past the coils and cool it much faster that normal. On the brew day in question, the pump dropped the temperature of 13 gallons of wort from boiling to 75 F in about 45 minutes. Once the wort temperature has reached its target cooling point (I like to switch to pushing ice water through the coils after the temperature is below 90 F), turn the pump off and let the wort sit, covered, for 20 minutes. This allows the hops to settle in the middle of the kettle. After the settling is done, close the ball valve on the kettle and switch the exit tubing to a sanitized line that runs into a carboy. Then, open the valve slightly and turn the pump back on. 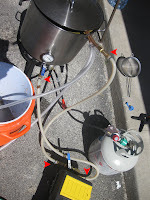 The goal is to fill the carboys slowly, so the hops in the center of the kettle do not get pulled into the pump intake and moved to the carboy. I would estimate that I pump to the carboys at about 25% of the pump's maximum speed. Once all the wort has been transferred to the carboy, make sure to clean the pump and hoses well. I do this by immediately putting the emptied hoses into a tub of sanitizer. I clean the pump itself by flushing cold water from the garden hose through the pump head, followed by pouring sanitizer through it as well. The pump head does not need a extremely good cleaning, as it will have boiling wort move through it again on the next brew day. But, it helps to flush it well when the wort has not had a chance to dry inside the pump head and hoses.